It's been a while since we've blogged about bespoke bike accessories. Perhaps we've been saving our energy for this post about the most beautiful bike baskets you could imagine. 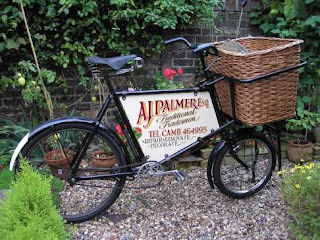 A long while ago, in the quiet rolling hills of Somerset, there was an English basketmaker. His fine craft was passed down through the generations, father to son, until it ended up in the nimble fingers of one David Hembrow. 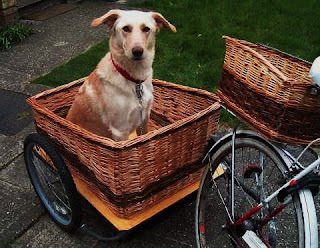 David produces all manner of baskets, using the finest English willow, but it is his personal passion for bicycles that make him create wonderful, custom-made bike baskets. 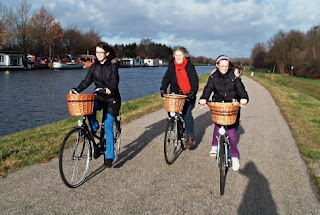 His love of bicycling even caused him to up stakes and relocate himself and his family to Assen, Netherlands, where bike culture has thrived for at least as many generations as David's family has practised their craft. 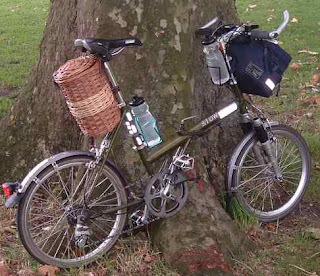 David's website is a goldmine of inspiration for thinking up a custom-designed basket for your bike, as well as a personal insight into David's craft. You can see heaps of photos of baskets he's made - standard and customised - as well as view a film wherein he makes a basket. It's also fascinating to read about his family's proud history of basketmaking. There are even lovely photos of his family, as below, riding their bikes with two-tone willow baskets sitting proudly up front. Only the imagination sets the limit for what David can create. He'll happily engage you in a discussion about your needs and your desires. As you can see below, the man can do anything your heart, or his, desires. The prices are reasonable for hand-crafted quality and we are quite convinced that a Hembrow bike basket will compliment any bicycle on the planet. It's bespoke, it's old school craftwork and it's timeless. Not merely content with making baskets, David's passion for cycling has caused him to branch out into Study Tours of Dutch bike infrastructure for politicians, cycle co-ordinators, cycle campaigners and anyone interested in cycling infrastructure. Read more about the study tours here.